Russian educator, censor, and communal worker; born in Wilna; died at an advanced age after 1882. His father, Isaac Markusewich, was one of the few Jewish physicians who graduated from the university which existed in Wilna from 1803 to 1833, when it was removed to Kiev. Isaac's annotations of the "'Aruk," written about 1830, were published fifty years later in Smolenskin's "Ha-Shaḥar"(x. 44-52). Joseph Seiberling, who was educated in a German university (Ph.D.), was censor for Jewish books in Kiev for about fifteen years, and was entrusted by the Russian Ministry of Public Instruction with Jewish educational interests as the successor to Leon Mandelstamm ("Allg. Zeit. des Jud." 1868, p. 378). During the time he resided in St. Petersburg he took a prominent part in its Jewish communal affairs; he was also the friend and patron of such well-known scholars as I. B. Lewinsohn, A. B. Gottlober, P. Smolenskin, and others. He received from the Russian government four decorations, including that of the Order of Vladimir of the fourth class, and a pension in recognition of his services. Being more practical than his predecessor, he amassed a large fortune, and after having served his government thirty years he obtained permission to become an Austrian subject and settled in Vienna. 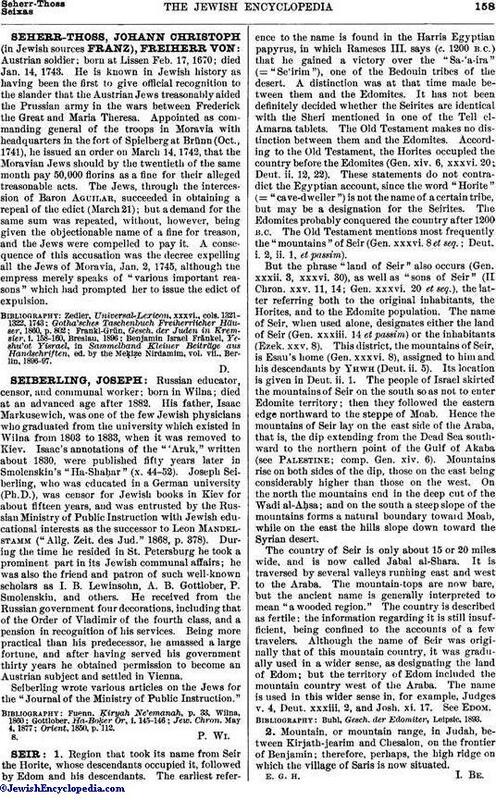 Seiberling wrote various articles on the Jews for the "Journal of the Ministry of Public Instruction."